I used size US 13 circular needles, which produces about 2 st. per inch, and knits very quickly. The twist had just a little over enough to make the hat, so he insisted I leave the tail attached. 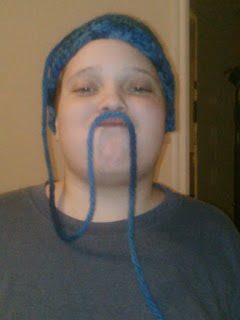 I admit I did not anticipate its transformation into a blue Fu Manchu. I love Alfredo sauce, and so do my kids, as long as it's not the stuff in the jars. 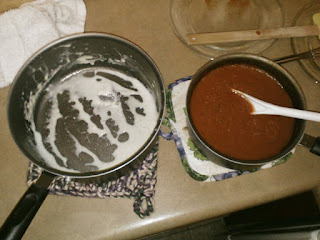 Pre-made spaghetti sauce can be doctored and made to taste good, but there's just nothing you can do to fix pre-made Alfredo sauce. I finally hunted down a recipe for Alfredo sauce and made a batch last night, though I was worried how it would turn out since I've never made it before. I also made some doctored spaghetti sauce as a Plan B in case the Alfredo experiment went badly.